Stock-Selection Methodology, the Valuentum Buying Index - Valuentum Securities Inc.
At Valuentum, we think some of the best opportunities arise from an understanding of a variety of investing disciplines in order to identify the most attractive stocks at any given time. Valuentum therefore analyzes each stock across a wide spectrum of philosophies, from deep value through momentum investing. We think companies that are attractive from a number of investment perspectives--whether it be growth, value, income, momentum, etc.--have the greatest probability of capital appreciation and relative outperformance. The more deep-pocketed institutional investors that are interested in the stock for reasons based on their respective investment mandates, we posit the more likely it will be bought and the more likely the price will move higher to converge to its "true" intrinsic value (buying a stock pushes its price higher). On the other hand, we think the worst stocks will be shunned by most investment disciplines and display expensive valuations, poor technicals and deteriorating momentum indicators. Click to Sign Up! First 14-days FREE! We think stocks that meet our demanding criteria fall in the center of the Venn diagram below, displaying attractive characteristics from a discounted cash-flow basis, a relative value basis, and with respect to a technical and momentum assessment. The size of the circles generally reveals the relative emphasis we place on each investment consideration, while the arrows display the order of our process -- value first then technicals and momentum last. We may like firms that are undervalued both on a discounted cash flow (DCF) basis and relative value basis, but we won't like firms just because they're currently exhibiting attractive technical or momentum indicators. We're not traders or speculators. We target the long term, and we want to have a strong process to support the ideas we deliver to our subscribers. The center of the Venn diagram above, the Valuentum Buying Index (VBI) combines rigorous financial and valuation analysis with an evaluation of a firm's technicals and momentum indicators to derive a rating between 1 and 10 for each company (10=best). Because the process factors in a technical and momentum assessment after evaluating a firm's investment merits via a rigorous DCF and relative-value process, the VBI attempts to identify entry and exit points on what we consider to be the most undervalued stocks. We think research firms that just focus on valuation may expose readers to a stock on its way down (a falling knife), while those that just use technical and momentum indicators may expose portfolios to significantly overpriced stocks at their peaks. It is our view that only when both sides of the investment spectrum are combined can investors find undervalued stocks at potentially timely prices for consideration. 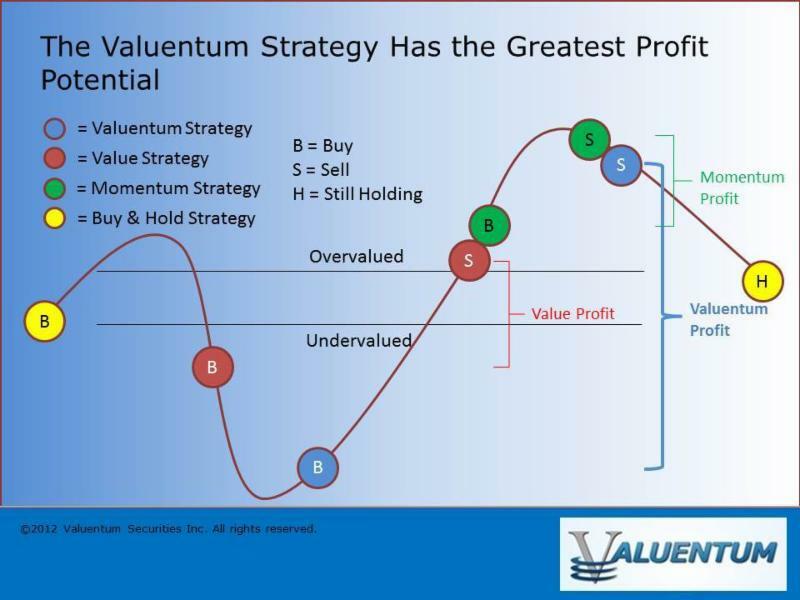 Let's examine the chart below, which showcases how the Valuentum process, by definition, may have the greatest profit potential of any common investing strategy. The Valuentum process targets adding stocks to actively-managed portfolios when both value and momentum characteristics are "good" and removing them when both value and momentum characteristics are "bad" (blue circles: Buy --> Sell). We define the Valuentum strategy as capturing the entire equity pricing cycle, while the value and momentum strategies individually truncate profits, as illustrated in the image below. Image shown for informational/illustration purposes only. Furthermore, we think Valuentum subscribers are less likely to be involved in so-called value traps because we demand material revenue and earnings growth for firms to earn a 10 on the Valuentum Buying Index. Value traps often occur as a result of secular declines in a firm's products or services, resulting in deteriorating revenue and earnings trends (and often a falling stock price). We also think Valuentum subscribers are less likely to be exposed to these "falling knives" since the process requires firms to not only be undervalued, in our opinion, but also be exhibiting bullish technical and momentum indicators before we would consider adding them to the newsletter portfolios. Since the stock market is a forward-looking mechanism, price usually leads fundamentals. Without a turnaround in price, the risk that the fundamentals of an undervalued stock have not turned for the positive is higher. Where value strategies may encourage the buying of a stock all the way down regardless of whether fundamentals ever turn (red circles: Buy --> Sell), the Valuentum strategy attempts to steer clear of these situations. The Valuentum Buying Index is designed to wait for technical improvement in the equity, which often precedes fundamental changes at the company. Let's walk through the three investment pillars of our stock-selection methodology. The Valuentum Buying Index methodology starts with in-depth financial statement analysis, where we derive our ValueCreation, ValueRisk, and ValueTrend ratings, which together provide a quantitative assessment of the strength of a firm's competitive advantages. We compare a company's return on invested capital (ROIC) to our estimate of its weighted average cost of capital (WACC) to assess whether it is creating economic profit for shareholders (ROIC less WACC equals economic profit). Firms that have improving economic profit spreads over their respective cost of capital score high on our ValueCreation and ValueTrend measures, while firms that have relatively stable returns score well with respect to our ValueRisk evaluation, which impacts our margin-of-safety assessment. After evaluating historical trends, we then make full annual forecasts for each item on a company's income statement and balance sheet to arrive at a firm's future free cash flows. We derive a company-specific cost of equity (using a fundamental beta based on the expected uncertainty of key valuation drivers) and a cost of debt (considering the firm's capital structure and synthetic credit spread over the risk-free rate), culminating in our estimate of a company's weighted average cost of capital (WACC). We don't use a market price-derived beta, as we embrace market volatility, which may provide investors with opportunities to buy attractive stocks at bargain-basement levels, in our view. A forward-looking Economic Castle rating is then derived. Click here to view a sample stock report. We then assess each company within our three-stage free cash flow to the firm (enterprise cash flow) valuation model, which generates an estimate of a company's equity value per share based on its discounted future free cash flows and the company's net balance sheet impact, including other adjustments to equity value (namely pension and OPEB adjustments). Our ValueRisk rating, which considers the underlying uncertainty of the capacity of the firm to continue to generate value for shareholders, sets the margin of safety bands around this fair value estimate. For firms that are trading below the lower bound of our margin of safety band, we consider these companies undervalued based on our DCF process. For firms that are trading above the higher bound of our margin of safety band, we consider these companies overvalued based on our DCF process. We think a focus on discounted cash-flow (DCF) valuation helps to prevent investors from exposing their portfolios to significantly overpriced stocks at their peaks. The image below reveals how pure momentum investors may expose their portfolios to pricing extremes and dramatic falls (green circles: Buy --> Sell). The Valuentum Buying Index attempts to steer clear from these situations. Our discounted cash-flow process allows us to arrive at an absolute view of the firm's intrinsic value. However, we also understand the critical importance of assessing firms on a relative value basis, versus both their industry and peers. Many institutional money-managers--those that drive stock prices--pay attention to a company's price-to-earnings (PE) ratio and price-earning-to-growth (PEG) ratio in making buy/sell decisions. With this in mind, we have included a forward-looking relative value assessment in our process to further augment our rigorous discounted cash-flow process. If a company is undervalued on both a price-to-earnings ratio and a price-earnings-to-growth (PEG) ratio versus industry peers, we would consider the firm to be attractive from a relative value standpoint. Once we have estimated a firm's intrinsic value on the basis of our discounted cash-flow process, determined if it is undervalued according to its firm-specific margin of safety bands, and assessed whether it has relative value versus industry peers, we then evaluate the company's technical and momentum indicators in an attempt to consider entry and exit points on the stock (but only after it meets our stringent valuation criteria). Rigorous valuation analysis and technical analysis are not mutually exclusive, and we believe both can be used together to bolster idea generation. An evaluation of a stock's moving averages, relative strength, upside-downside volume, and money flow index are but a few considerations we look at with respect to a technical and momentum assessment of a company's stock. We embrace the idea that the future is inherently unpredictable and that not all fundamental factors can be included in a valuation model. By extension, we use technical and momentum analysis in an attempt to help safeguard against value traps, falling knives, and the opportunity cost of holding an undervalued equity for years before it potentially converges to "fair value." Other research firms may not consider opportunity cost as a legitimate expense for investors. Though the time frame varies depending on each idea, on a theoretical basis, we would expect our best ideas to "work out" over a 12-24 month time horizon (on average) -- the duration of any individual idea can vary considerably, however. We tend to include firms in the Best Ideas Newsletter portfolio when they register a 9 or 10 on our Valuentum Buying Index (VBI) and tend to remove firms from the Best Ideas Newsletter portfolio when they register a 1 or 2 on the Valuentum Buying Index. In theory, the Valuentum Buying Index attempts to maximize profits on every idea within the Best Ideas Newsletter portfolio, with the understanding that momentum does exist and that prices over and under shoot intrinsic value all of the time. A value strategy (10 --> 5), for example, may truncate potential profits, while a momentum strategy (4 --> 1), for example, may ignore profits generated via value assessments. The Valuentum Buying Index seeks to capture the entire profit potential, as shown below. 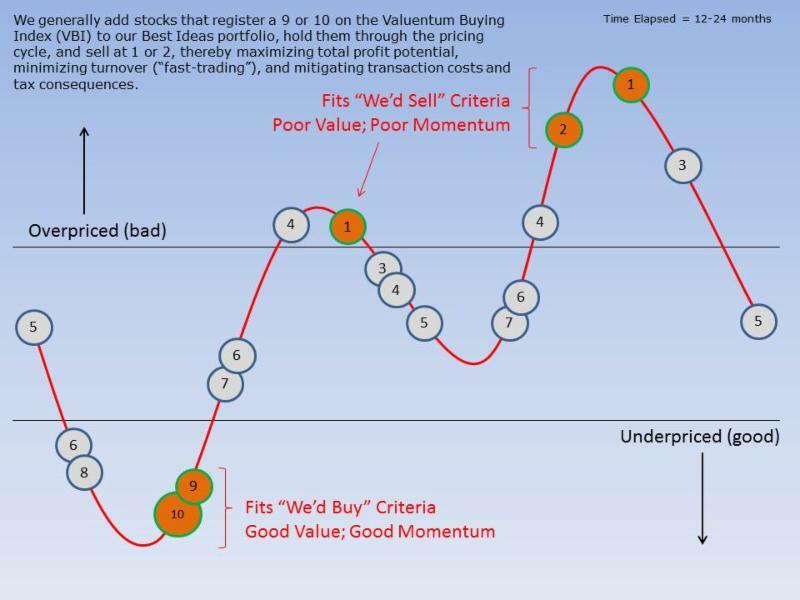 Let's follow the red line on the flow chart below to see how a firm can score a 10, the best mark on the Valuentum Buying Index (a "Top Pick"). Please click here to view an enlarged pdf version. First, the company would need to be 'UNDERVALUED' on a DCF basis and 'ATTRACTIVE' on a relative value basis. The stock would also have to be exhibiting 'BULLISH' technicals. The firm would need a ValueCreation rating of 'GOOD' or 'EXCELLENT', exhibit 'HIGH' or 'AGGRESSIVE' growth prospects, and generate at least a 'MEDIUM' or 'NEUTRAL' assessment for cash flow generation, financial leverage, and relative price strength. This is a tall order for any company. Firms that don't make the cut for a 10 are ranked accordingly, with the least attractive stocks garnering a score of 1 ("We'd sell"). Most of our coverage universe falls between 3 and 7, but at any given time there could be large number of companies garnering either high or low scores, especially at market lows or tops, respectively. Please click here to enlarge the chart below for easier viewing. Image shown for informational purposes only. * Actual results may differ from simulated information being presented. The High Yield Dividend Newsletter, Best Ideas Newsletter portfolio and Dividend Growth Newsletter portfolio are not real money portfolios. Results are hypothetical and do not represent actual trading. * Actual results may differ from simulated information being presented. The High Yield Dividend Newsletter portfolio, Best Ideas Newsletter portfolio and Dividend Growth Newsletter portfolio are not real money portfolios. Results are hypothetical and do not represent actual trading. Valuentum is an investment research publishing company. Valuentum Buying Index methodology originally published June 21, 2011.